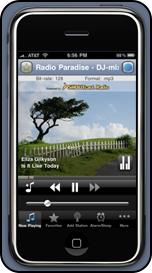 Stormy's Tunemark Radio is designed to be an advanced radio tuner for both iPhone and iPad. Access tens of thousands of stations from around the world. This app is designed to be an alternative for playing Internet radio stations, without the annoying ad banners. If you have any suggestions for improvements to this app, please contact Stormy Productions and pass along your thoughts. Available on iTunes for only 99 cents here. Background play on both iOS 4 and earlier iOS versions! SHOUTcast™ Radio is one of the largest directories of professionally and community programmed online radio stations in the world. Today SHOUTcast™ Radio features over 25,000 stations from around the globe. If you're into popular or indie music, or want to check out local or world programming, you're sure to find something you like on SHOUTcast™ Radio. Get the free SHOUTcast™ Radio toolbar here. Buy the Tunemark Radio app on iTunes here for only 99 cents!